Last Saturday, I set a new PR, 1:58:35, a minute improvement from last October’s PR, at the Town’s Half Marathon. While this is only four minutes faster than my very first half in 2010 and one minute faster than last year’s Healdsburg Half, I wasn’t trying to run a PR. In fact, this race occurred only three weeks after my blow up at San Francisco Marathon; I thought trying to run anything but easy might be a recipe for disaster. The weather conditions were perfect (low 60s and overcast), and after recovering from the Paul McCartney concert on Thursday night, I felt ready to run on Saturday morning. Near Fox Theater in downtown Oakland. My legs felt much better last week compared to the days leading up to San Francisco Marathon. Taking a few weeks off from “real” running and replacing the runs with swimming, spinning, and stretching seemed to have loosened up my tight hips and IT bands. For the first half of the race, I managed splits around 8:40, a pace I’d like to run at my next half. 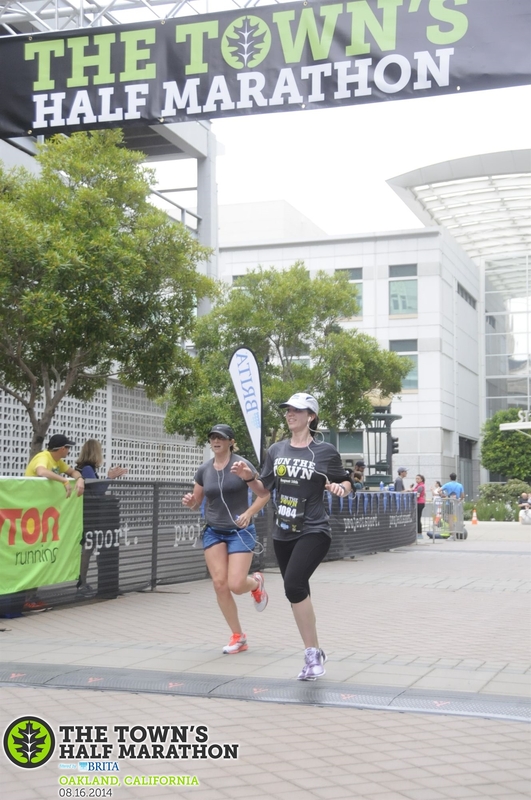 I was unsure of my pacing to start, as I haven’t properly trained for a half marathon in nearly a year and am unsure of what my half marathon race pace could be. I fell apart during the last few miles, with my right leg hurting and limping (but not as badly as it did during the San Francisco Marathon). The race was well-organized. Water stations were placed every two miles, so even when a mile marker was missing (or I didn’t see it), I’d know roughly know where I was on the course. 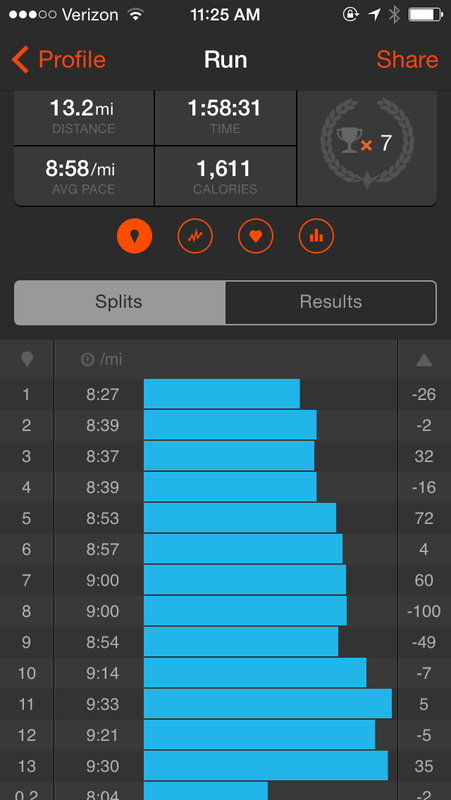 Around mile 7, steep pitches near the overpasses spiked my heart rate, but I managed to keep my pace consistent. Spectators were sprinkled throughout the course, but crowds with signs were no where to be found (I’m guessing more people will be aware of this race next year). 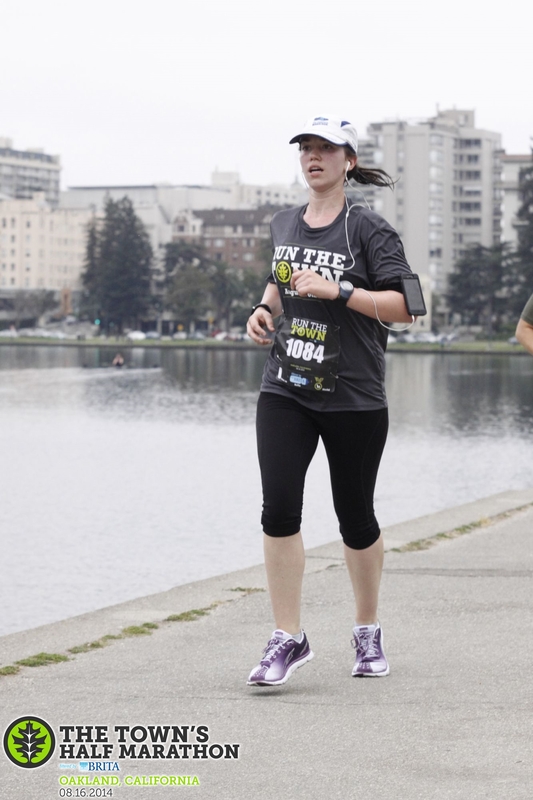 The most difficult section of the race for me was Lake Merritt, miles 10 to 12.5. I knew the race was almost over, but my pace was dropping, and the slight lateral movement around the trail hurt my legs. I was very tempted to walk, but I knew a PR was in my reach. I managed to dig deep and finish strong; I was elated to see a lower number on the race clock than I’ve ever seen before! After the race, I drank muscle milk and stretched/foam rolled on mats and rollers they provided, a thoughtful touch to post-race activities. We also received Brita water bottles and a mason jar, both very earth-conscious Bay Area items. 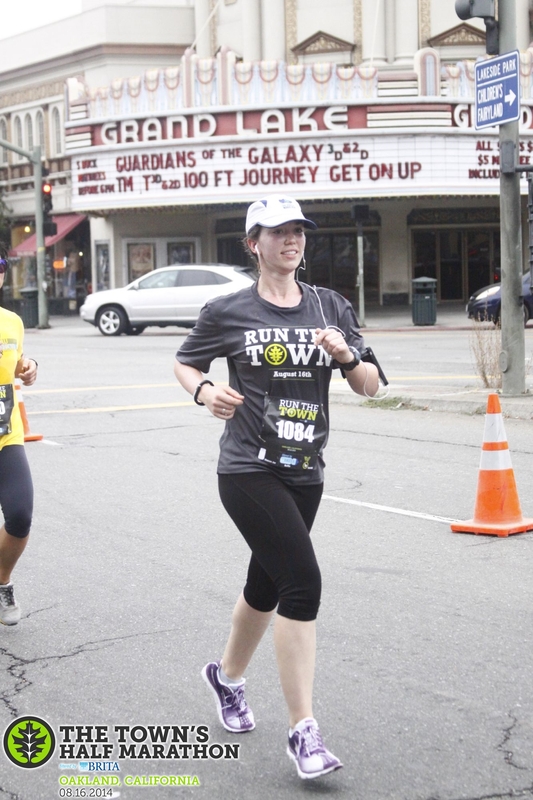 The Town’s Half Marathon promised the best of Oakland, and it delivered. Jesse and I experienced beautiful sections of the city we would have never discovered on our own, and I’ve earned a new appreciation for the city across the bay. Congratulations! Your half experience actually sounds a lot like mine this weekend, right down to the 8:40 splits in the beginning! Mason Jar cheers!! Wow, way to go!! How amazing!! What a great PR!! 🙂 🙂 Great race recap!! Congratulations!! Congratulations! Sounds like a great race!! Thanks Angie! It was fabulous! That is awesome! Way to go! Lookin strong! Glad you had fun. BTW, I meant to tell you in your other post – they were talking about the PM concert on the radio here. Did you know that the last song he played in his encore was the last song the Beatles played in that same stadium on their encore – and that was the last time they ever played a concert together? Pretty cool of him to do that. Huge congrats on the PR!! It’s always more fun when you’re least expecting it! Congrats on a PR and an awesome race! Sounds like a great race with a great result. It is funny how if the mental aspect of training/racing is rested you can see the same benefits of resting the physical aspects. Huge congrats and hugs Taylor! So happy for you! Great race!! Congrats on the PR…isn’t it nice when it just kind of happens!!//! I am still waiting for a sub 2 but I am hoping to break that next year!! There is always something to look forward too!!! Yay surprise PRs! Congrats! We saw Paul at Candlestick too! I cried during Blackbird. Le sigh.